The NAC&ZAC Car Door Cover can protect your car door panel against claws and drool. Now you can take your dog for a ride and have him stand on the door without worrying his claws scratching your brand new car. Our car door protector covers are made from high quality micro-suede fabric, thick and sturdy enough to protect your car from sharp nails. There are 2 covers in the package, one for the left door and one for the right. The cover is 28'' wide X 22'' high, one size fits all. 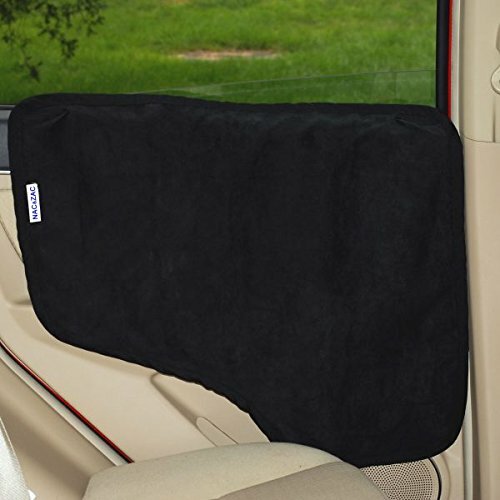 The covers are waterproof, keeps your car clean and dry from your dog's drool. Easy to clean. Simply wipe with a damp cloth or sponge. And the covers are totally machine washable. We also care about your pet's health, our covers are PVC free and no harms to your pets. If you don't want to stick anything to your brand new leather door panel, you can use the elastic tabs, it's super easy to install, just insert the tabs between the window and the door panel. There are 6 tabs in the package, 3 tabs for each cover. And we have designed 4 slits on each cover to insert the tabs, you can insert the tabs into any 3 slits based on the size and structure of your door panel. If you want to scroll up and down the windows after that covers are installed, you can use the self fastening tapes, it has no interaction with the window. The cover would stay in place when you roll down or up the window. There are 6 pieces of self fastening tapes in the package, 3 for each cover. There are 2 short pieces of self fastening tapes in the package to attach the bottom of the covers to the door panel, this helps hold the cover when the window is open and stops flapping in the wind. Two options to install, either insert the tabs between your window and car door panel, or use the sticky back self fastening tapes. Choose the best option to fit your car. You can roll down and up the windows when installed with the self fastening tapes. Stays in place and no worries about scratching the window. Waterproof and No PVC, safe for your pets. Machine washable. Self fastening tape at the bottom to stop flapping in the wind. LIFETIME SERVICE. We offer lifetime service for our pet seat covers. If you have any concerns with our products, please contact us. If you have any questions about this product by NAC&ZAC, contact us by completing and submitting the form below. If you are looking for a specif part number, please include it with your message.